The term troll comes from two things: the mythical creatures that live under bridges in folklore that most kids are familiar with, and the verb “trolling”, which is a method of fishing. Trolls are “trolling” for trouble, trying to create arguments and disagreements wherever they can. Explaining this to your kids will help them to visualize an internet troll as someone who wants to be nasty in order to bait others into a fight. They are “fishing” for a negative reaction, hoping to incite defensiveness, anger, and upset. However, it’s important to make it clear that not every person with a contrary opinion is a troll. Try to find some examples to show them of a normal, healthy discussion online, versus a comment that is trolling. Trolls are just out to entertain themselves by dragging others into pointless arguments. The best way to handle them is to completely ignore them. The popular saying about this is, “don’t feed the trolls”. Explain to your kids that they are never obligated to respond to anyone online. For their safety, they shouldn’t be engaging with strangers in comments sections or on social media. 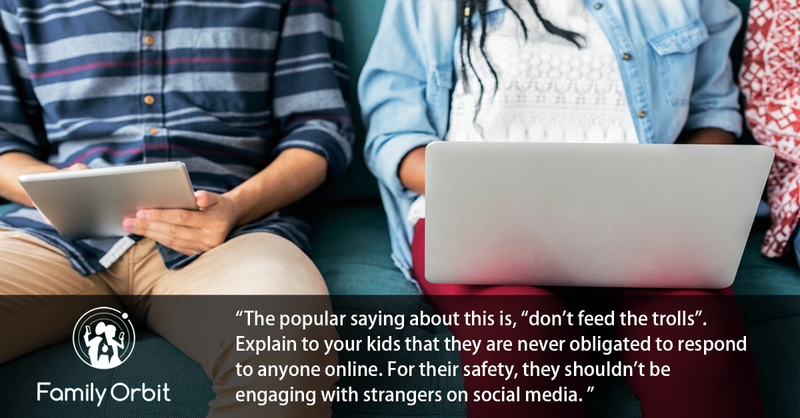 This is one big reason why it’s so important for parents to monitor internet use closely. Just like the bullies that kids encounter on the schoolyard, cyberbullies seek to humiliate, harass, and intimidate. They can be completely anonymous, or they can be individuals that kids know in real life, such as classmates. They can send harassing emails, text messages, and messages on social media sites. They can also send threats, both of physical and emotional harm. If your child is dealing with a cyberbully, there are a few steps that you can take together to combat them. You can block the bully from social media accounts, change your profile name, and change your contact information. It’s a good idea to save copies of the threatening messages and emails that your child receives. In some extreme cases, you may even want to report the bullies to law enforcement. Hopefully, it won’t ever come to that. Tell your kids to let you know if they receive any messages that are hurtful or unusual. Monitoring their accounts and keeping track of their smart phone contacts are another way to stay on top of potential issues. The internet can be a safe and useful space for kids with the right parental controls in place. Take the time to talk to your children about trolls and cyberbullies so they know what to watch out for, and when to come to you for help.